28th January 1706, Sion Hill, Wolverley, near Kidderminster, Worcestershire, England. The date is not certain and it could have been December 1705. Baptism records at the St John the Baptist parish church say he was christened on 28th January by his father John and his wife Sara. It is speculated that John and Sara lived at Sion Hill Farm, formerly Upton House and originally came from London although some say Herefordshire. At all accounts they were quite prosperous. Unknown but probably the local Seabright school. 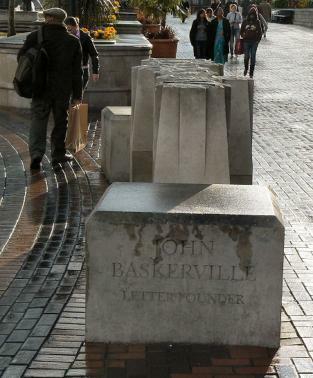 1723: Originally Baskerville worked as a footman but by the age of seventeen he had become a writing master and engraver of headstones for graves working from the Bull Ring in Birmingham. Records at St Mary’s Handsworth and St Bartholomew’s churches in Edgbaston show that he was the engraver of headstones in their churchyards. 1738: John Baskerville started a successful japanning (varnishing metals) business in Birmingham which over the next ten years made him a wealthy businessman. 1750: He began to experiment with paper making, type founding, printing and the manufacture of printer’s inks. One of his typefaces bears his name. 1754: He produced his first new typeface with the help of his assistant cutter John Handy. 1757: John Baskerville published his first printed work, an edition of the poems of Virgil at his house at Easy Hill. He went on to produce many more volumes of the classics such as those by Milton and an edition of the Bible. 1758: Became printer to Cambridge University and printed a copy of the Bible. This was unusual for a freethinker but many think it his finest work. His last great work of printing was “Orlando Furioso” by Lodovico Ariosto which was commissioned by French booksellers. Baskerville’s Easy Hill press worked or only 20 years but made Birmingham into an undisputed centre of book printing in Europe. 1762: Baskerville was becoming disheartened by the lack of money his printing business was making and by the criticisms he was receiving and decided to offer the whole business to the French Court for the sum of £8,000, however the offer was declined. 1769: Baskerville found new energy and restarted his work on printing. This is likely to have been because a rival printer Nicholas Boden was proposing a folio Bible and the two printer’s carried out a war in the letters column of the local newspaper Aris’s Birmingham Gazette each espousing their edition as the best. 8th January 1775, Birmingham, England. Originally buried standing up (as he was an atheist) in his own garden inside a conical mausoleum. The inscription read: Stranger – / Beneath this cone in unconsecrated ground/ A friend to the liberties of mankind directed his body to be inhum’d/ May the example contribute to emancipate thy mind/ From the idle fears of superstition/ And the wicked arts of Priesthood. The building was destroyed in 1791 in the Birmingham riots. This land was cut through by the major canal building in the area and In 1826 his body was dug up and used at a local peepshow. In 1829 it was placed in the vault at Christ Church. It was finally transferred to the Warstone Lane cemetery, Birmingham where it can be seen today. 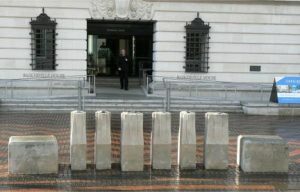 A memorial to him, forming the word Virgil in single large letters of his typeface, has been set up in Centenary Square outside Baskerville House.